Back in baseball’s offseason, minor league baseball announced a good-sized rule change. When a game went into extra innings, each team would begin its half of an inning with a runner already at second base. In other words, we’d all pretend each team hit a lead-off double to start the inning – and go from there. Baseball’s fans, known for ideological purity, reacted with predictable fury. It wasn’t baseball, they said. It went against the time-honored principles of the game, which was designed to be timeless. These are the same people who filled Commissioner Rob Manfred’s voicemail with tirades when he announced that players would no longer have to throw four pitches in order to complete an intentional walk. Teams could just wave the batter to first, and the game would proceed from there. The slight uproar was in spite of the fact that very little has ever happened during the course of an intentional walk that affected a game. I recall a Bisons game in which, during a tight situation in the ninth inning of a late-season game, a Buffalo pitcher threw a wild pitch to allow the tying run to score. The Bisons went on to lose a heartbreaker. Here we are, then, a few months into the season. It’s time for a good-sized evaluation. And based on what I’ve seen, I’m OK with it in minor-league play. The rule is used in women’s softball, a game that has very little scoring at times and thus can stretch toward infinity without a little tweak of the rules. Soccer went to penalty kicks to decide games tied after an overtime period for the same reason. I’ve been to a few games this season at Coca-Cola Field in which the Bisons and their opponent have gone to extra innings. I’ve been a little surprised at how easy it has been to be accepted. The teams finish a warm-up at the start of an inning as usual, and a runner (the last person to bat in the previous inning) trots out to second. Play ball. All right – how has it worked? Has it accomplished the goal? 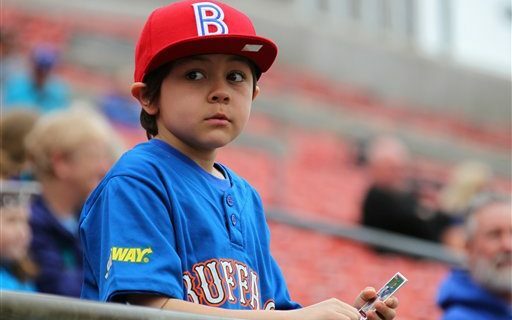 From April 6 until July 18, the Bisons had played 89 games. Eight of them went into extra innings, which would figure to be something in the neighborhood of a typical ratio. Five of them were over after 10 innings, one ended after the 11th, and the other needed 12 innings to reach a decision. By coincidence, the 12-inning contest was Buffalo’s first of the season, a 4-3 win over Pawtucket. By that standard, the minor leagues have accomplished their goal here. That’s connected to one of the game’s little secrets. No one wants to see an 18-inning game in minor-league baseball. They probably don’t want it in the majors either, but they put up with it in the top level because there is plenty at stake for all concerned. The days where a starter can work nine innings, relievers can work a couple of innings each, and a long reliever can go on almost indefinitely when multiple extra innings are needed have departed. Pitching staffs are built for use in nine inning games. Get past 12 or 13 innings, and managers have to start straining arms and think about recalls because they might not have anyone to pitch in the bullpen in the next day or two. And how do fans react to a game that threatens to give every player seven or eight trips to the plate? They leave. They don’t want to hang around an event for four hours or more, so they depart without knowing who won. The new system has worked well, at least in Buffalo. I would guess it would draw a similar response from people in other cities. I’m not sure if I’m ready to adopt it in the majors yet, even if you started to add baserunners a little later (say in the 12th inning). But the sport does have some problems with pace of the game, and I’m all for trying experiments to see if we can fix them.